Some spots are truly hidden, some are so obvious you do not expect them to be so good and some are just so small you might cycle past them a few times a week without noticing it. I guess the owners of BUN realised this phenomenon. For a while now there’s a big chalkboard outside letting the people know BUN’s in town. Job well done, you have got my attention now. Located just a minute from where I live I’m happy I have met BUN, a small cosy spot serving excellent sandwiches, to eat inside or as a take-away. The 2 brothers working at BUN didn’t start their entrepreneurial life serving a good bun. For a while now they’ve been known as the Pizzabakkert with a few locations in Rotterdam. 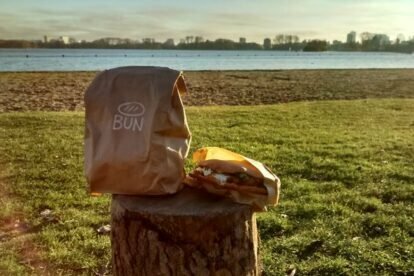 Because a pizza can be a bit heavy for breakfast and Dutch people tend to eat sandwiches for lunch they started BUN during the day and continue as the Pizzabakkert just after noon. First it was only possible to order a sandwich online but since a few months you can also go inside and order a bun. Personally I really like the chicken bun, yummy! If you’re craving for chocolate, try the bun with Nutella and banana. Because I’m on the run most of the time when I pass BUN I tend to order a chicken or meatloaf bun as a take-away. The perfect snack to eat outside in the Vroesenpark, when the weather allows it.